Pop some Eggos in the toaster because the return of Stranger Things is upon us. To celebrate the launch of Season 2 on Netflix this Friday, the hugely successful show has planted a spooky Easter egg inside Spotify. All you have to do is play a song from the Stranger Things, Vol. 1 or Vol. 2 soundtrack. After a few seconds, you'll transport to the Upside Down. 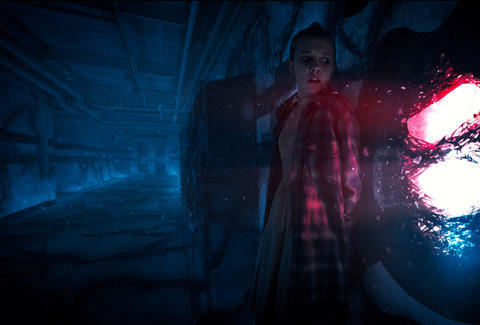 Snow floats in that weird, still way it does around the Demogorgon, a flashlight strobes along the bottom of the screen, and the whole situation gets eerie. It really sets the mood. Unfortunately, only desktops and web browsers travel to the Upside Down, which means mobile users have to settle for regular old right-side-up reality. And if you don't find yourself transported to another dimension, leave the Christmas lights packed up and don't turn the walls into a Ouji board: Just update Spotify and you should be all set. That should keep you busy until your inevitable binge on Friday, but if you need a little refresher on all the gang's inter-dimensional, coming-of-age antics, look no further. James Chrisman is a News Writer at Thrillist who also contains secret Easter eggs. Send news tips to news@thrillist.com and follow him on Twitter @james_chrisman2.